As Amazon continues to dominate the e-commerce space, smaller online retail businesses must do more to compete. Updating a website to include or enhance these three features will benefit businesses beyond simply improving the user experience. Investing in navigation, design, and content also has important branding and SEO benefits. Use this article to explore how each of these website features contributes to a high-quality, effective user experience. Most people surveyed (94%) by Clutch think that easy, effective website navigation is the most useful website feature. The easier a website is to navigate, the faster and more efficiently a user can access the content they want. With both time and patience in short supply, e-commerce brands must provide a linear navigation menu to guide visitors through the site. For example, Amazon is known for its clear menu structure that makes it easy to move between pages. 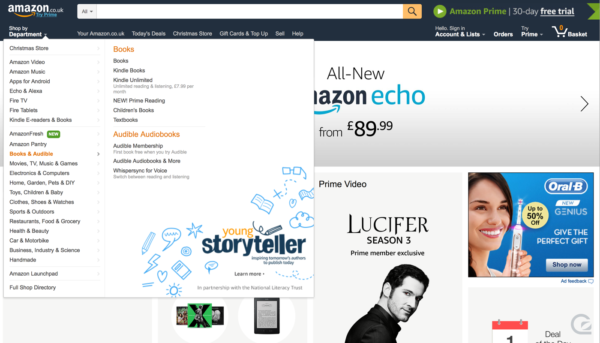 Amazon’s UX centers around the search bar, which allows a direct line to its wide array of products. According to the research group Baymard Institute, Amazon’s search function is “state-of-the-art.” Users can search, filter, and view search results with the help of search autocomplete, filtering, and guidance functionality. The search algorithm personalizes the page content based upon these interactions to deliver users more relevant content. All generations know how to use a search function, which helps Amazon drive maximum sales and customer loyalty. Most people (94%) have purchased from Amazon in the last year, according to Business Insider. Amazon’s UX also benefits from having changed little in the past 20 years. While the company has tweaked and updated the menu and the search functionality to suit user preferences, the approach has largely remained consistent. Amazon’s navigation is constant and intuitive – ensuring that shoppers can always find what they need with ease. Small e-commerce businesses can benefit from the basics of Amazon’s navigation tools because users are already accustomed to the website’s usability patterns. People like a trendy website but only when it doesn’t interfere with their content consumption. According to Clutch, 83% of people agree that websites should be trendy and updated in their appearance. Beautiful website UX signals to visitors that your company is trustworthy. Visual appeal is critical to persuading people that your site content is authoritative and relevant, and indicates your company is successful. “Websites that are more attractive and include more trimmings create a greater feeling of trustworthiness and professionalism in consumers,” said Dr. Brent Coker, a professor at the School of Business and Economics at the University of Melbourne. While trendy website design dazzles visitors and generates trust, good website UX prioritizes functionality and ease of use. E-Commerce businesses should re-design their websites to blend beauty and function for the optimal user experience. Trendy UX design can enhance the perception of your brand, but ultimately, less is more. Aim to balance the functionality and the visual appeal of your site to afford users a streamlined yet novel experience. E-commerce sites must offer valuable content to retain users and drive sales. Half of people (50%) will leave a website for good if the content is irrelevant, according to Clutch. The best content is authoritative and provides an answer to your visitors’ issues. Remember to create content that will educate and resolve the pain points for users at every stage of the funnel. This will allow you to gain the trust and sales of the widest possible audience. To determine whether your content is relevant, look to user intent mapping technology. People visit your site for various reasons, including to gain information, learn from you, or to complete a transaction. User intent mapping software helps you to identify what your visitors want. By tracking how people navigate your site, you learn why people visit, where they look, and how to optimize your site design to align with these behavior patterns. Analyze the data from the User Flow Report in Google Analytics. This graphical representation of site traffic shows you paths people take through your site and where they bounce, which points to where you should tweak your site design. E-commerce brands must provide website users with a streamlined and valuable site experience. Features such as site navigation, relevant content, and up-to-date UX design are pivotal to persuading people to engage with and return to a website. If you are a smaller e-commerce businesses look to compete with larger retail brands, research web designers that manage website maintenance and design with users in mind. Investing in a high-quality website builds brand authority and demonstrates an ability to deliver for consumers. Offering the website features users want is an effective way to boost engagement and conversions.